that pertains to Earth Science at Ridgefield Memorial High School! Earth Science, or Science Nine, is no longer being offered at Ridgefield Memorial High School. Having taught it nearly every year since 2004, I will truly miss teaching it. Ninth grade students will now be enrolled in the Geophysics course as RMHS moves toward the “Next Generation” of science education. Good luck! This web site will stay up as a “living memorial” to the Earth Science course. Students are welcome to take a look around and see what the ninth grade science course used to look like. Enjoy! The Earth rotates out of view from the sun. 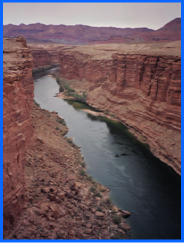 The Pariah River Canyon shows striations in the rock. The other half of the moon is covered by a shadow. Water causes erosion on the US border with Canada. The new moon casts a shadow over part of the sun.